TAIPEI CITY, November 26, 2017 – The World Baseball Softball Confederation’s is debuting Team WBSC, an international collection of players and coaching staff with experience as high as Major League Baseball, in Taiwan’s Asia Winter Baseball League (AWB), which is in its fifth season and operated by the Chinese Professional Baseball League (CPBL). The AWBL is a largely developmental league for younger players and up-and-coming prospects. It is an opportunity for players to showcase their ability, to work on specific skills, and to hone various areas of their game. 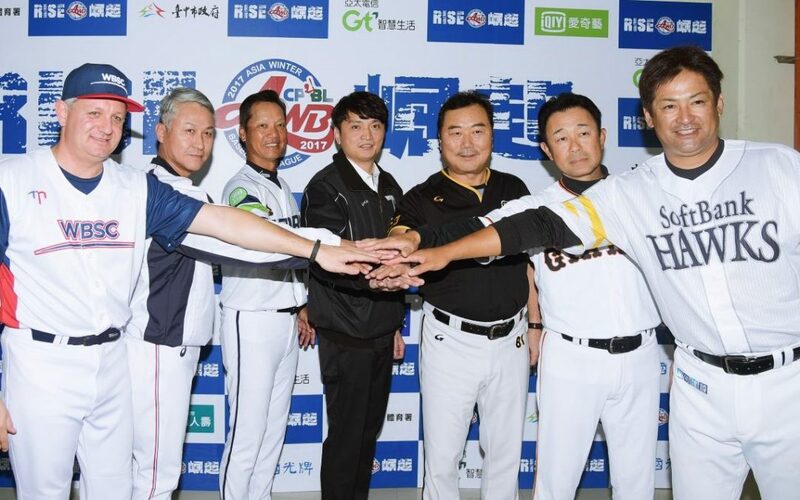 AWB Teams comprise CPBL, Japan Amateur Baseball Association (JABA), Korea Baseball Organization (KBO), Nippon Professional Baseball (NPB) East, Nippon Professional Baseball (NPB) West and WBSC. Each team will play 17 games, from Saturday, November 25 to Thursday, December 14 at Douliu Baseball Stadium (14 games), Taichung Intercontinental Baseball Stadium (30 games), and Taoyuan International Baseball Stadium (seven games), prior to three days of playoffs in Taichung, December 15-17, to determine the league champion. The AWB 2017 season will feature several top young professional prospects.